Visually stunning and meticulously staged, but hindered by limited depth and stifling linearity. Stranded on the mythical island of Yamatai following a freak storm, 21-year-old Lara Croft's career as a videogame protagonist begins with suffering. In the opening hours of Tomb Raider she is stabbed, burned, drenched, assaulted and almost freezes to death: that's if you're doing well, meeting the demands of every linear climbing section, gunfight, finickety stealth sequence and quick-time event that presents itself. Fail any of these and you'll also watch her be crushed, impaled, strangled, mauled and so on. "Lara sobs and trembles, and evident effort has been made to slow down and focus on the details of her experience." This early cruelty is the game's most strikingly idiosyncratic feature. Lara sobs and trembles, and evident effort has been made to slow down and focus on the details of her experience. Hunger necessitates finding a bow and hunting deer. Her elbows shake believably when she mantles up onto a ledge. Her first human kill leaves her blood-soaked and distraught. Give it a few months and I suspect these opening hours will be what people will be talking about when they talk about Crystal Dynamics' reboot. It's certainly what they've been talking about until now. Play on for another few hours, however, and you'll find yourself in a hybrid of third-person shooter and linear platformer, Lara trading the bleak little lethalities of life as a shipwreck survivor for a parade of regulation set-pieces: an escape from a burning building, a helicopter crash, a section where your guns are taken away, a climactic assault on an enemy stronghold. Moment by moment, the game evolves into something more familiar. During a battle with Yamatai's savage Solarii brotherhood high up in the mountains, the camera crash-zooms onto a set of blast doors which burst open to reveal an armoured islander holding a riot shield. Stop me if you've heard this one before: you beat him by dodging his machete blows and shooting him in the back when he stumbles. Everything about this character - from his introduction to his execution - is lifted from the Big Book of Miniboss Design, Third-Person Shooter Edition (Bleszinski/Mikami, 2005). 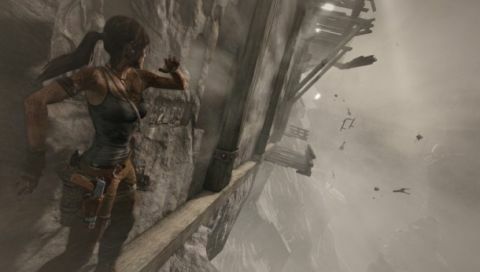 Shortly afterwards, Lara hops onto the bottom rung of a ladder leading up a rickety radar tower whose topmost transmitter is her crew's best hope for rescue. Once you're on that bottom rung, the game will only accept one input: forwards. Press forward and Lara climbs: press anything else and Lara stops. There's no way to fail, though a few pre-canned moments will have a rusty rung give way and leave her hanging. There's a point where the game slips into a cutscene but pretends that it hasn't: nothing changes, with the exception that it's no longer accepting your input. Let go and Lara will keep climbing without you. Adventure game sleight-of-hand, as taught at Uncharted's School of Seven Bells - what is being pickpocketed, in this case, is your right as a player to have your agency reflected in the events taking place on-screen. "It relaxes back into the series' matinee adventure comfort zone." Then, after another calamitous mountainside descent, Lara emerges out onto a familiar landscape - a hub area - from a new vantage point. Your options for traversal have been expanded by the acquisition of rope arrows that allow you to pull down certain doors and affix zip-lines to particular posts. There are letters and relics to find, and secret tombs to plunder for bonus skill points. Tomb Raider becomes about gentle exploration for a while, and there's nothing particularly traumatic about it. It's very, very pretty. You forget about the multiple times you watched Lara's throat be ripped out by a wolf because you kept fumbling a quicktime event. You stop wondering if pressing the buttons to make Lara go through this carnival of horrors is not an act of cruelty in and of itself. The memory of that first traumatic kill fades as you kneel behind another piece of waist-high cover to ping arrows into the cranii of obliging brotherhood warrior after obliging brotherhood warrior. When the game gives up on being a story about a young woman having an absolutely terrible time, it improves. It relaxes back into the series' matinee adventure comfort zone, and some of its later set-pieces are genuinely spectacular as a result. "Lara herself is the game's standout success, particularly when she stops running." The quality of the writing varies. Conversations between Lara's fellow survivors are believable despite their rote characterisation: nerdy twenty-something male, tough black woman, untrustworthy TV personality, spiritual Maori, and so on. Lara herself is the game's standout success, particularly when she stops running and decides to take direct action: the perceptible change she undergoes is a good example of writing, performance, and animation working together to create a sympathetic and admirable person in place of a fantasy. The game spits out some real eye-rollers, though - it's honestly a miracle that Lara can find anything to fall off given the amount of scenery the villain manages to chew through in his relatively brief screen-time. Enemy chatter doesn't fare much better. I can think of a number of things I might say if I suddenly found myself with an arrow in my sternum, and "damn, she's a good shot!" isn't high on the list. The real weakness of Tomb Raider's storytelling, though, is its failure to express its big ideas in the way it plays. Lara receives two pieces of advice repeatedly during the game: 'trust your instincts' and 'keep moving forward'. Both jar with the reality of what Tomb Raider actually wants you to do. 'Trust your instincts' should really be understood as 'trust Lara's instincts': or at least, trust Survival Instinct mode, which highlights objects in the environment you can interact with. Trust that this type of craggy rock will always be climbable, that these barricades will always yield to your rope arrows, that this particular type of scenery will always be flammable - and that you should always do all of these things because that's why they're there. Trust your own instincts and you risk throwing the game off its rhythm. In Tomb Raider, acting with initiative carries a payload of risk akin to heckling at a comedy show. You'll either be punished, or - worse - you'll puncture some meticulously preconceived bit and cause the whole thing to deflate. There's a combat section midway through where you can either fight through a narrow canyon or sneak past on an elevated route. While shimmying across a beam above a pair of Solarii cultists I made the choice to jump off and attack them, figuring that I had the advantage and that the salvage I would gain from killing them was worth it. I pressed the button to drop and Lara fell stiffly to the ground. The camera moved into the canyon at an angle it wasn't designed for, and, trapped in Lara's picking-herself-up animation, I couldn't respond fast enough to attack before I was gunned down. "Rather than encourage self-motivation Tomb Raider rewards passive acquiescence." If I'd stuck to the stealth route the game would have continued to animate beautifully: if I'd opted for a gunfight the camera would have known where to be. I made a choice that the designers didn't anticipate and the game could not adapt to support it. 'Keep moving forward', then, is a better piece of advice - but rather than encourage self-motivation Tomb Raider rewards passive acquiescence. As long as you don't forget which button press goes with which bit of the environment, the island will ensure nothing truly terrible happens to you. This obliging design is why Tomb Raider succeeds as a lean-back-and-watch-the-fireworks platformer, but the dissonance is undeniable. You're told that you're seeing a person discovering their strength: what you're shown is someone discovering that the god of zip-line placement loves them very, very much. You're encouraged to hunt and explore in order to maximise the amount of new skills and equipment upgrades you receive, but neither progression path is rewarding. The power you can gain in this way is carefully prevented from altering the pre-planned flow of the game: there's no way to earn a new traversal skill before its time, for example. In its place are shallow upgrades to the amount of loot Lara receives, or the amount of experience she gets for certain types of kill - and effectively all these do is allow you to level up faster. A few skills do alter the flow of combat, but only in minor ways: headshot indicators are helpful but inessential, ammo capacity upgrades are superfluous in a world where every new body you create can be looted for a fresh clip. "When the circumstances are right, Tomb Raider becomes a decent if narrow stealth action game." The areas where Tomb Raider comes together are those where you're given more freedom. When the circumstances are right, Tomb Raider becomes a decent if narrow stealth action game, and figuring out how to silently eliminate the maximum number of enemies before being detected is satisfying and says something about the person Lara is becoming. A scattering of optional tombs offer exploration and puzzle challenges that encourage improvisation with the game's robust physics system. Most can be cleared in a couple of minutes, but their solutions feel like they originate from your actions in a way that the rest of the game withholds. Multiplayer takes the singleplayer's rock climbing and zip-lining and applies them to a competitive team shooter, adding trap-setting and limited environmental destruction for spice. It's host-based, rather than running on dedicated servers, and I had problems with rubberbanding even on a fast connection. When it does work, the majority of the players I encountered found it more effective to strafe around with an assault rifle than make use of any of the more distinctive features. The designers have provided space for set-piece moments - escapes over collapsing bridges, freeing friends from snare traps - but these will only happen if players find them a more effective way of farming for experience and upgrades than simply gunning each other down, and that doesn't seem to be the case. Abandoned matches are also an issue - roughly half of the games I played ended in victory by default. The PC version is a good port, for the most part. Fairly comprehensive graphics and control options are available out of the gate, and manual hacks can enable more. It ran perfectly at the highest settings on an Intel i5 system with 8GB of RAM and a Radeon 6970, including the optional 'TressFX' tech that renders Lara's hair as free-flowing, individually modelled strands. I had persistent problems on a comparable system running a GeForce 560 Ti, however, including crashes and unexplained dips to a slideshow framerate that even affected the menus. Players have already found a few workarounds, and a patch is reportedly in the works - but caution is advisable if you're running an Nvidia card. Tomb Raider is frequently very enjoyable, and there's no denying its production values or the care taken in scripting every inch of its critical path. I had a fine time. My problem with it is that I came in willing to have other, less fine kinds of time - I was willing to feel hounded, frozen and wounded in sympathy with its protagonist. Tomb Raider is never challenging, either emotionally or in what it asks you to do. It gestures at being something deeper, but I don't think you can simply tell the player what to feel. I wanted to participate in Lara's journey, but in the end I just held the button down and tried not to ruin it. A single game can't be held to account for the weaknesses of an entire genre, but they can't be ignored: narrative ambition is fantastic, but execution matters.